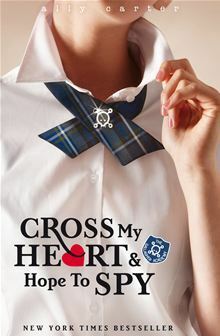 Title: Cross My Heart And Hope To Spy. Good reads: Cammie Morgan is back, and it's clear that her life hasn't calmed down since the events of I'd Tell You I Love You, But Then I'd Have to Kill You. At first, giddy anticipation is in the air. Gallagher Academy, Cammie's elite spy school, is hosting a visit from a covert training center for boys. Soon after the boys' arrival, though, everything goes dangerously awry when a series of security breaches are discovered at the academy. Worse yet, teenage agent-in-training Cammie is being blamed for the penetration. 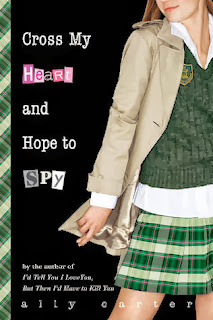 With the school's top-secret status at risk, the Gallagher Girls have to work quickly to save their beloved school. In a nut shell: I really loved this book Its well written, and it grabbed me from the first page to the last!! Anyone who hasn't read it, I really recommend it, this and the whole series!! Characters: wow. Just wow. I love these characters, I was glad that Cammie found love!! I really feel a connection to these characters, and I really love how different they are and yet they can still be friends even though they are like chalk and cheese! Plot: is original, great, fun, amazing, new, exciting- I...In a nut shell: I really loved this book Its well written, and it grabbed me from the first page to the last!! Anyone who hasn't read it, I really recommend it, this and the whole series!! Plot: is original, great, fun, amazing, new, exciting- I could go on a night, what I really want to say is that I love this book, and I think that it's one of the best I've ever read. My point: Great book, must read! !